At RHRLI, we treat patients who’ve lost their hair for a variety of different reasons. One of the most common causes of hair loss is androgenetic alopecia or male pattern hair loss, which is believed to be caused by dihydrotestosterone (DHT). DHT is a derivative of the male hormone testosterone which causes hair follicles to shrink. Hair loss can also be caused by things such as emotional or physical stress, infections, or bad reactions to medication. One of the biggest contributors to hair loss can be medical conditions or disease. RHRLI can help patients whose lives have been affected by disease find a permanent solution to hair loss or thinning hair. We want you to know some of the ways disease relates to loss of hair and give you information about treatment. 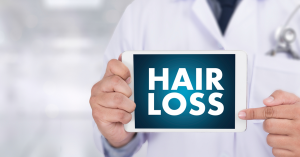 RHRLI is the only hair loss treatment center on Long Island that has the ARTAS® System, a minimally invasive treatment that uses robotic technology to transfer donor hairs. One condition that is very often related to hair loss is thyroid disease. According to the Everyday Health website, hair growth depends on a functioning thyroid gland. Abnormal levels of the thyroid hormone produced by the gland can affect hair growth. If you have too much thyroid hormone, your hair can be fine and the hair on your scalp can thin. Having too little of the thyroid hormone can also cause hair loss on both the scalp and the rest of the body. Thyroid disease is usually treatable and the hair loss problem should clear up when you get back to a healthy hormone level. Another disease that can bring about hair loss is lupus, which is an autoimmune disease that can damage skin, joints, and organs. According to the National Resource Center on Lupus, hair loss can be a common side effect of lupus or of the medication used for the treatment of the disease. It’s possible the hair loss can be permanent as a result of scarring. If there is no scarring your hair will often grow back and when lupus medication treatment begins to control the disease, hair will also usually grow back if the hair loss is related to the medication. Lupus medication can also bring about brittle hair. When you think of hair loss as a result of disease treatment, you’d be hard pressed not to think of cancer. Chemotherapy treatment for cancer can cause patients to lose hair. This is because chemotherapy drugs which are designed to attack cancer cells, also attack other rapidly growing cells including those in the hair roots, according to the Mayo Clinic. Chemotherapy can cause you to lose hair all over your body, not just on your scalp, and hair loss usually begins two to four weeks after you start treatment. Your hair will usually grow back several weeks after treatment but it may have a different texture and color. Different medications can cause hair loss and different doses can cause anything from some hair thinning to total loss of hair. If you’re dealing with hair loss related to disease or other causes RHRLI can help you find a permanent solution. The ARTAS® System uses robotic precision to transplant healthy donor hairs to where they’re needed resulting in a healthy head of hair. To learn more, contact RHRLI today.